How to Cite This Chapter: Brito JP, Jarząb B, Płaczkiewicz-Jankowska E. Graves Disease. McMaster Textbook of Internal Medicine. Kraków: Medycyna Praktyczna. https://empendium.com/mcmtextbook/chapter/B31.II.9.2.1 Accessed April 23, 2019. Stagnaro-Green A, Abalovich M, Alexander E, et al; American Thyroid Association Taskforce on Thyroid Disease During Pregnancy and Postpartum. Guidelines of the American Thyroid Association for the diagnosis and management of thyroid disease during pregnancy and postpartum. Thyroid. 2011 Oct;21(10):1081-125. doi: 10.1089/thy.2011.0087. Epub 2011 Jul 25. 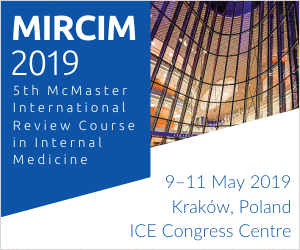 PubMed PMID: 21787128; PubMed Central PMCID: PMC3472679. Bahn RS, Burch HB, Cooper DS, et al; American Thyroid Association; American Association of Clinical Endocrinologists. Hyperthyroidism and other causes of thyrotoxicosis: management guidelines of the American Thyroid Association and American Association of Clinical Endocrinologists. Endocr Pract. 2011 May-Jun;17(3):456-520. Erratum in: Endocr Pract. 2013 Mar-Apr;19(2):384. PubMed PMID: 21700562. Bartalena L, Baldeschi L, Dickinson AJ, et al. Consensus statement of the European group on Graves' orbitopathy (EUGOGO) on management of Graves' orbitopathy. Thyroid. 2008 Mar;18(3):333-46. doi: 10.1089/thy.2007.0315. PubMed PMID: 18341379. Graves disease (GD) is an autoimmune disease in which the thyroid-stimulating hormone (TSH) receptor (TSH-R) is an autoantigen. Stimulation of this receptor in the thyroid by TSH-R antibodies (TRAb) results in the increased secretion of thyroid hormones, development of signs and symptoms of hyperthyroidism, thyroid hypertrophy, and vascular proliferation. The activation of cellular immune-response mechanisms against the same antigen present in orbital and skin fibroblasts results in the development of clinical symptoms that are not directly related to the thyroid gland. Thyroid-associated orbitopathy (Graves orbitopathy [GO]) is a condition associated with ocular symptoms caused by autoimmune inflammation of the soft tissues of the orbit in the course of GD, leading to a temporary or permanent damage of the eye. Patients may develop a severe form of progressive ophthalmopathy with infiltrates and edema, which is associated with a particularly high risk of permanent complications. 1. Clinically overt or moderately symptomatic hyperthyroidism (see Thyrotoxicosis); in the elderly, cardiac symptoms may be the only manifestation of the condition. Typically, the course of GD follows a pattern of exacerbations and remissions, with the presence of a vascular goiter associated with a typical vascular bruit; exophthalmos may be seen (Figure 1) (but overt orbitopathy is not a necessary diagnostic criterion for GD). Less commonly, there are signs and symptoms of autoimmune dermatitis, including pretibial myxedema (thyroid dermopathy—a pathognomonic but rare sign) and thyroid acropachy (clubbing—a very rare manifestation). 2. GO develops simultaneously with hyperthyroidism or within 18 months from its onset; it may precede other symptoms of hyperthyroidism and rarely is the only symptom of GD. In exceptional cases, it may be associated with hypothyroidism. Patients with GO complain of eye pain and burning, tearing, reduced visual acuity, sensation of grittiness, photophobia, and diplopia. The findings on clinical examination include exophthalmos, palpebral and periorbital swelling, conjunctival injection, and impaired ocular movement. The risk of sight loss is related to corneal ulcerations caused by incomplete eyelid closure and to possible optic nerve compression (with an early symptom of impaired color vision). GD may manifest as overt or subclinical primary hyperthyroidism (see Thyrotoxicosis) accompanied by features of autoimmune inflammation, either clinically overt or limited to laboratory test results only. 1) Low serum TSH concentrations and high (less commonly normal) serum free thyroid hormone concentrations (usually free thyroxine [FT4] levels are sufficient for diagnosis; in patients with normal FT4 levels, serum free triiodothyronine [FT3] concentrations should be assessed). In overt hyperthyroidism, a significantly greater increase in FT3 than in FT4 levels is a poor prognostic factor as to the response to antithyroid therapy. In remission, the hormone test results are normal. 2) Elevated TRAb levels confirm the diagnosis (they should be assessed before the start of antithyroid therapy or within the first 3 months of treatment). Normalization of TRAb levels indicates immunologic remission of the disease. 3) Other laboratory test results are as in hyperthyroidism (see Thyrotoxicosis). 2. Imaging studies: Thyroid ultrasonography reveals hypoechogenic thyroid parenchyma. The thyroid gland is usually enlarged. The presence of nodules does not exclude GD. Computed tomography (CT) imaging of the orbits (contrast enhancement is not necessary) in patients with active and severe ophthalmopathy allows for the evaluation of the soft tissues of the orbit, its bone walls (important for planning surgical decompression), and thickening of the extraocular muscles. Magnetic resonance imaging (MRI) of the orbits allows for the assessment of edema or fibrosis of the extraocular muscles. 1) Overt or subclinical hyperthyroidism and elevated TRAb levels. 2) Hyperthyroidism with concomitant thyroid-associated orbitopathy and evident involvement of the orbital soft tissues (Figure 1), or with thyroid dermopathy (Figure 2 in Thyrotoxicosis). 3) Hyperthyroidism with increased radioactive iodine uptake in thyroid scintigraphy if TRAb levels cannot be measured. 4) Isolated thyroid-associated orbitopathy with elevated TRAb levels. 1) Recurrent hyperthyroidism with >6-month periods of euthyroidism without antithyroid treatment. 2) Hyperthyroidism and a family history of GD or Hashimoto thyroiditis, or another autoimmune disease in the patient. 3) Hyperthyroidism with a vascular goiter confirmed by ultrasonography (diffuse parenchymal hypoechogenicity). Isolated elevation of TRAb levels is not sufficient to diagnose GD (it may occur in relatives of patients with GD who do not develop the disease themselves). It is important not only to recognize the inflammation of the orbital soft tissues and establish the diagnosis of GO, but mostly to determine whether the severity of symptoms warrants starting treatment (this requires a complete ophthalmologic examination and in many cases also the CT imaging of the orbits). 1) Sight-threatening orbitopathy: Optic neuropathy and/or corneal breakdown. 2) Moderate to severe orbitopathy (Figure 1): Eyelid retraction ≥2 mm, moderate or severe involvement of the orbital soft tissues, exophthalmos ≥3 mm, constant or intermittent diplopia. 3) Mild orbitopathy (Figure 1): Minor eyelid retraction <2 mm, mild involvement of the orbital soft tissues, exophthalmos <3 mm, transient or no diplopia, corneal exposure responsive to lubricants. 2) Pain on attempted up or down gaze. 3) Redness of the eyelids. 4) Redness of the conjunctiva. 5) Swelling of the eyelids. 6) Inflammation of the caruncle, plica, or both. CAS scores ≥3 on a scale of 1 to 7 indicate active orbitopathy. Differential diagnosis of GD and other causes of thyrotoxicosis: Figure 1 in Thyrotoxicosis, Table 1 in Thyrotoxicosis. Elevated TRAb levels confirm an active autoimmune process in GD. Ocular signs and symptoms accompanying nonautoimmune hyperthyroidism (the key parameter are TRAb levels). If proptosis is unilateral, differentiate with orbital lymphoma, metastasis, or granuloma (pseudotumor of the orbit). There is no effective treatment of the causes of GD, and thus treatment focuses on controlling the symptoms of hyperthyroidism and orbitopathy (Figure 2). The primary goal is to achieve euthyroidism as soon as possible, and then a joint decision should be taken with the patient to plan the subsequent treatment strategy. If pharmacotherapy is the principal treatment modality, try to achieve and maintain immunologic remission. Normalization of TRAb levels is a good prognostic factor. Similarly, reduction of the goiter size and resolution of features of a vascular goiter (due to the reduction of the stimulating effect of TRAb and resolution of lymphocytic infiltrates) are good prognostic factors as indirect signs of immunologic remission. Recurrence of hyperthyroidism is usually an indication for radical treatment with radioiodine or surgery. Principles of hyperthyroidism treatment: See Thyrotoxicosis. The optimal duration of pharmacologic treatment is 18 months, and at least 12 months is necessary to achieve durable immunologic remission. 1) A classical treatment with methimazole (dosage: see Thyrotoxicosis) should be continued until the patient is euthyroid (~3-6 months); the dose is usually 20 mg/d, and then it is gradually tapered to the maintenance dose (see above; to be continued for ~18 months). Propylthiouracil may only be used in patients with allergy to methimazole in whom this treatment is indispensable (dosage: see Thyrotoxicosis). The time to achieving euthyroidism is usually longer. 2) A fixed-dose methimazole treatment, for instance, 10 mg/d, is used mainly in patients with minor clinical manifestations of hyperthyroidism. 1) Lack of hormonal remission: Despite antithyroid treatment, the levels of thyroid hormones do not normalize or increase again on attempts of dose reduction. 2) Lack of initial immunologic remission: Persistent TRAb levels >10 U/L after 6 months of drug therapy (resolution of clinical signs and symptoms of hyperthyroidism does not guarantee achieving immunologic remission). 3) Lack of durable immunologic remission: Elevated TRAb levels after 12 months of treatment indicate a high risk of recurrence (75%-90%) despite euthyroidism. 4) Recurrence of hyperthyroidism after achieving hormonal and immunologic remission. A true relapse is diagnosed when the remission has lasted ≥1 year after the discontinuation of treatment. 1) Pretreatment before surgery should last 4 to 6 weeks (minimum 2 weeks). The preferred drug is methimazole because of the shorter time required to achieve euthyroidism; it should be discontinued after surgery. 2) Pretreatment before radioiodine therapy should last 1 to 3 months. The preferred drug is methimazole, because of the lower inhibition of thyroid sensitivity to ionizing radiation (methimazole should be discontinued in due course [Thyrotoxicosis]). The method of choice in the radical treatment of hyperthyroidism in GD: Table 2 in Thyrotoxicosis. In approximately three-fourths of patients, one administration of 131I is sufficient, whereas in the remaining cases, a repeated dose is required, usually after 6 months. Patients with large goiters causing tracheal compression and airway compromise should be treated in a hospital (a transient increase in the thyroid volume is possible due to edema). In severe or moderate active GO, radioiodine treatment is not suggested as a therapy for GD due to the risk of worsening GO symptoms.Evidence 1Weak recommendation (downsides likely outweigh benefits, but the balance is close or uncertain; an alternative course of action may be better for some patients). Moderate Quality of Evidence (moderate confidence that we know true effects of intervention). Quality of Evidence lowered due to indirectness (evidence from trials using radioactive iodine among patients with mild Graves orbitopathy suggests that the use of radioactive iodine for active severe Graves disease could carry a significant risk for adverse effects. The possible harm is valued very highly). Tallstedt L, Lundell G, Torring O, et al. 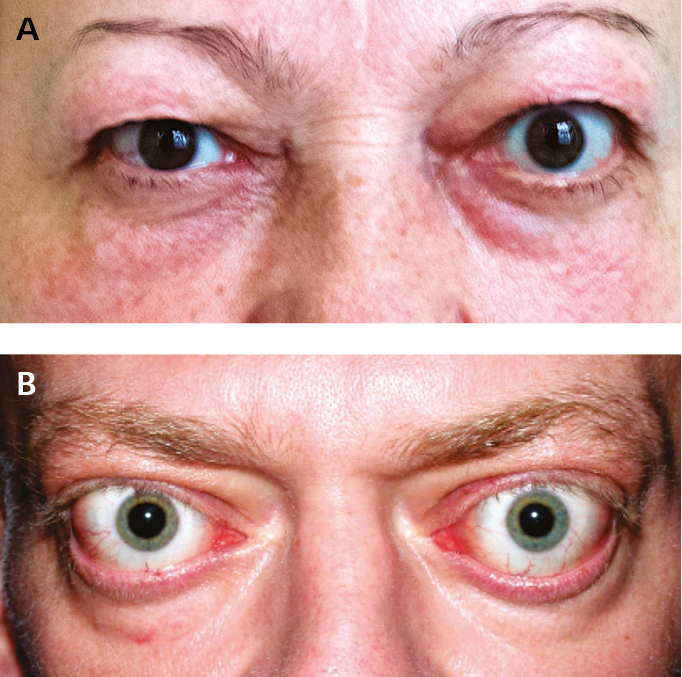 Occurrence of ophthalmopathy after treatment for Graves' hyperthyroidism. The Thyroid Study Group. N Engl J Med. 1992 Jun 25;326(26):1733-8. PubMed PMID: 1489388. In mild active GO, a concomitant glucocorticoid therapy is suggested to accompany 131I treatment (because of the risk of transient exacerbation)Evidence 2Weak recommendation (benefits likely outweigh downsides, but the balance is close or uncertain; an alternative course of action may be better for some patients). Low Quality of Evidence (low confidence that we know true effects of the intervention). Quality of Evidence lowered due to inconsistency and imprecision. Bartalena L, Marcocci C, Bogazzi F, et al. Relation between therapy for hyperthyroidism and the course of Graves' ophthalmopathy. N Engl J Med. 1998 Jan 8;338(2):73-8. PubMed PMID: 9420337.—prednisone 0.3 to 0.5 mg/kg/d starting from day 1 to 3 of radioiodine administration and continuing for 1 month; then the dose should be gradually tapered off to discontinue within ≤3 months. Smoking exacerbates GO, and thus patients with GO should be recommended to quit. An unequivocal indication for surgery is the presence of a nodule with cytologic or clinical features of malignancy (the risk of thyroid cancer in GD is 2%-7% lifelong, similar to that in other forms of nodular goiter). Surgery is preferred in patients with concomitant severe orbitopathy or with large goiters (>80 mL) causing compression symptoms, particularly if the goiter contains large areas with no iodine uptake. The volume of the fragments of the thyroid gland remaining after surgery strongly correlates with the risk of recurrence of GD, which more and more often is a rationale for performing total or near-total thyroidectomy; however, due to a higher risk of long-term complications, this approach is not universally accepted. An unavoidable sequela of the surgery is hypothyroidism (at least subclinical), requiring hormone replacement therapy. 1) Sight-threatening orbitopathy: Start intravenous glucocorticoids immediately, consider orbital decompression surgery. 2) Moderate to severe orbitopathy: Start immunosuppressive treatment with glucocorticoids (in active disease – CAS ≥3/7) or consider surgery (if the disease is not active). 3) Mild orbitopathy: Symptoms do not affect daily activities and do not warrant immunosuppression or surgery; use symptomatic treatment only. Glucocorticoids are the first-line drugs in moderate to severe GO and should be started after careful evaluation and confirmation of disease activity. Intravenous pulse glucocorticoids are more effective and better tolerated than oral glucocorticoids in moderate to severe GO; thus, IV pulses of glucocorticoids are recommended as the treatment of choice.Evidence 3Strong recommendation (benefits clearly outweigh downsides; right action for all or almost all patients). Moderate Quality of Evidence (moderate confidence that we know true effects of intervention). Quality of Evidence lowered due to imprecision. Kahaly GJ, Pitz S, Hommel G, Dittmar M. Randomized, single blind trial of intravenous versus oral steroid monotherapy in Graves' orbitopathy. J Clin Endocrinol Metab. 2005 Sep;90(9):5234-40. Epub 2005 Jul 5. PubMed PMID: 15998777. Methylprednisolone pulses are given IV in a cumulative dose of 4.5 to 8 g (eg, 1 g every week for 6 weeks or 0.5 g twice weekly for 1-4 weeks, then 0.25-0.5 g/wk for up to 8-12 weeks); when intravenous glucocorticoids are contraindicated, oral prednisone is given 1 mg/kg/d for 6 to 8 weeks, then the dose is tapered off to discontinuation at 3 months. An optional method. The combination of glucocorticoids and radiotherapy yields better and longer-lasting effects than the use of either method alone. Diabetic retinopathy is the only contraindication. The only method of treatment of long-term sequelae of orbitopathy after the resolution of active disease. It is frequently a multistep procedure including orbital decompression, treatment of strabismus resulting from fibrosis of the extraocular muscles, and surgical procedures on the eyelids. Urgent orbital decompression surgery should be considered in patients with symptoms of optic nerve compression and when 1-week to 2-week intensive immunosuppressive treatment is ineffective. 1. Hyperthyroidism: Sometimes spontaneous remissions are observed in patients with untreated hyperthyroidism, but life-threatening complications may develop earlier (see Thyrotoxicosis). Pharmacologic treatment alleviates the symptoms of thyrotoxicosis and accelerates the remission, but recurrence rates are ~50%. In the majority of patients, TRAb levels normalize after ~6 months of treatment, but it does not guarantee a durable remission. The risk of recurrence is higher in male patients and in patients <20 years of age, as well as in patients with large goiters and high baseline FT3 to FT4 ratios. Hypothyroidism is always observed after surgery and is very frequent after effective radioiodine therapy; it may also develop after long-term pharmacologic treatment of GD. 2. GO: Spontaneous remissions with no long-term sequelae may be observed in untreated patients, particularly with mild orbitopathy. Nevertheless, in patients with severe active GO, the risk of permanent damage to the orbital structures (disturbances of eye movements and visual impairment or even loss of vision) is high, particularly in a severe form of progressive ophthalmopathy with infiltrates and edema. If treatment is started early (in active disease), serious sequelae can often be avoided. If exophthalmos is advanced and significant involvement of the soft tissues and extraocular muscles is present, or in cases of corneal involvement or optic nerve compression, the risk of permanent damage to the eye and alteration of the patient’s appearance is high. Strabismus and exophthalmos are surgically corrected after the remission of active disease is achieved. Figure 1. Thyroid-associated orbitopathy. A, mild orbitopathy (eyelid retraction, mild right eye proptosis without other symptoms affecting soft tissues). B, overt orbitopathy. Figure 2. 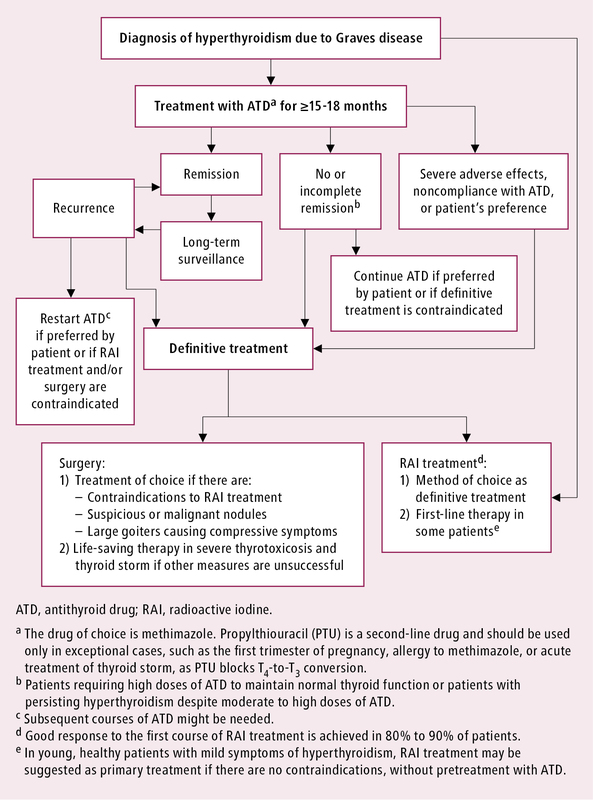 Algorithm of treatment of Graves disease.